Hurrah! After a mere 17 days my order from Panzerschiffe has arrived. Overall the style and quality is as I expected with a basic level of detail but certainly more than adequate for my needs. They actually fit in very nicely with the Stonewall models so the collection can be completed in my chosen scale of 1/2400th without having to resort to GHQ and C in C for the extra models. This is just as well as they would work out rather more expensive! S.M.S. Seydlitz - complete with, ahem, battle damage....The bow has not come out in the mould and the gun barrels on the rear turrets have broken on the left hand side. Replacements have been requested although I could, at a pinch, fix them myself. A couple of the models have some mould issues so I will be acquiring replacements - I could probably fix the issues myself but is pressed but to be honest I would rather have the casting replaced. They are pretty good for gaming pieces and I will happily add to the collection in due course. Sharp eyed readers will have noticed that I have purchased two Moltke class battle cruisers - well I will need to rebadge one for the Turks! H.M.S. Agincourt (left) and Erin - both of which were being built for the Turkish navy but requisitioned under Churchill's orders in 1914. I now have everything I need for the first phase of this collection and have some 69 models left to paint over the next three weeks. I managed to sneak in an hour or so with a paintbrush yesterday but it was fraught with peril! My trusty tin of Humbrol 'Mast Oak' has finally expired. This tin of enamel paint was probably around 30 years old and had been rescued with the application of some thinners on several occasions but when I opened it the mass of paint had finally turned into liquefied mess of granules with little covering capacity. I had seen this coming and indeed, had discussed the same with Mr Fox who very kindly acquired some Vallejo paints in the appropriate shade to be collected in due course. This did not resolve the immediate problem so I decided to have a rummage in my paint storage (the 'Old Tins home' if you like....) to see if I had another tin. As suspected, the search drew a blank BUT, I did manage to find another Humbrol Authenticolour that could feasibly be used - certainly the shade was close enough. The new tin (actually it had been opened which could have spelled disaster as I have no idea when I last used it!) is yet another Humbrol Authenticolour, this time from the Ancients set - 'Unbleached Linen'. This is absolutely close enough to the original shade as not to present any problems and the paint merely needed a good stir to be ready for action. Panic over and so I was able to tackle the wooden decking for the next 7 ships for the Royal Navy with a view to finishing this bunch by the weekend. We had nothing specific planned for the weekend (with the exception of tomorrow so I was hoping to get some more work done on the 1/2400th scale ships. Sadly this was not to be but by way of compensation SWMBO and I were able to get to our local boot sale where the two titles above were acquired - each of which costed the paltry sum of 50p making my expenditure the princely amount of £1! One for sheer inspiration value! 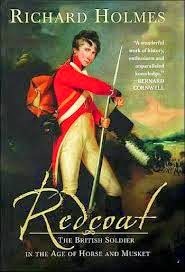 Redcoats and Richard Holmes need no introduction from me and so his overview of the period of the Red-coated British Soldier is a welcome addition to the library. The much maligned, usually despised but incomparable British 'other rank' forms the subject matter of the title - from the taking of the King's shilling, barrack life, active service, punishment and life under the colours. This is one I shall savour. Something for a possible project in due course - I have always fancied using an Arab Conquest army ever since WRG 6th edition. As I recall you could field the entire army as Irregular A fanatics with the morale advantage of a sacred banner! 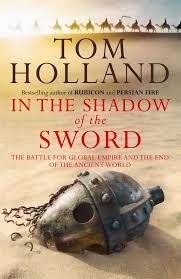 In the Shadow of the Sword by Tom Holland is another kettle of fish entirely. The book provides an overview of the 'end of the ancient world' - more specifically the years following the withering of the Roman Empire (in the West) and the aftermath of the early Arab conquests. It is not a military history as such although naturally this features during those turbulent years. I have long been interested in the Arab Conquest so this will provide a welcome backdrop to the period. Now here's the thing. I have been looking long and hard at the Jutland rules produced in the old Avalon Hill boardgame of the same name and have been pondering accordingly. I have also been revisiting Paul Hague's outstanding Sea Battles in Miniature and sure enough - a light bulb moment occurred and so I think that a fusion of the two may be viable option for my WW1 naval project. But wait a second - this idea was ringing some long distance bells - I wonder why? Then it came to me - Jutland Sea Battles in Miniature - was a blog post from way back in 2012 that I had forgotten about. Not only had I forgotten about but I had also forgotten about the great pile of notes I had made to go with it - notes that were quite close to being ready to turn into a draft set of rules! I have just based, undercoated and applied the first dry brush coat to the next eight models for the 1/2400th scale WW1 collection. There are two each of the Queen Elizabeth, Revenge and Orion classes for the Royal Navy, together with a further Lion and finally an additional Kaiser class as the sole reinforcement for the Germans. Whilst I have been in a capital ship painting frenzy I thought that maintaining the enthusiasm with this latest batch would be a good idea so I will tackle them before the destroyers and the Panzerschiffe models. I am planning on having this latest batch of models completed over the following weekend. After careful studying of Conway's, Jane's and the recently acquired Ian Allen title it appears that the model available actually represents the final dozen ships of the series - T 186 to T 197 (to be accurate the last 11 of the 12 as one was modified to look rather differently from her sisters). The dozen prior to these looked sufficiently close enough in general layout (the main difference with the fifty odd vessels prior to these was that they carried 3 torpedo tubes rather than 4) so will feature in the German fleet but it does raise the problem of acquiring some post 1911 models. Luckily Panzerschiffe cover a number of types and even C in C and GHQ could be used - I reckon I will only need a couple of dozen in any event so we will have to see what we can find in due course. In the meantime though, the order into Panzerschiffe for the gap filling of the battleships and battle cruisers has been placed and I will posting the pictures and review once they arrive in a couple of weeks. To start the Royal Navy off in the dreadnought battleship department I opted to tackle a selection of the first 12" gun armed types with some of the later 13.5" classes. For the former this meant the Bellerophons and the follow on St. Vincents whilst the latter were the King George V and Iron Duke classes. In time I will add some of the other 12" types as well as the missing Orions from the 13.5" range. There are some odd ships to be considered - Agincourt, Erin and Canada for example - and I will also want to add some of the 15" types just to round off the collection but whilst the former are some way off the latter is in hand. The models use my black undercoat with successive dry brushing with grey and with details blocked in. The key difference between the two fleets is that the Royal Navy start with a darker grey as the base (Humbrol Medium Gull Grey). I have used the same colour for the decks for both sides (Humbrol Mast Oak - and I need to find out what the modern equivalent is pretty darned quickly!) and my usual convention of the ships boats being white. Once again the models are from Stonewall Miniatures and are from the former Micro Matrix range. The Bellerophon class - these followed on from the original H.M.S. Dreadnought and were virtually identical to look at. The St.Vincent class carried a more powerful 12" gun than the earlier class and had narrower funnels but I have used the earlier Bellerophon casting as it is close enough looking - thereby ensuring eternal damnation at the hands of the rivet counters! The King George V class were the second of the 13.5" types - the first of which were the Orions. I have a couple of these to paint which will feature in the next batch. The final class of 13.5" armed battleships were the Iron Dukes which also featured the 6" gun for the secondary weapons, with the previous classes mounting 4" weapons. The next batch of capital ships to paint are the last of the Stonewall metal models and feature some 7 for the Royal Navy and a single Kaiser class battleship for the Germans. The disparity will get even larger when I get the Panzerschiffe models in as the Royal Navy will be gaining a further 6 ships whilst the Germans will gain only 4. Some of the metal models will need some preparation before painting (removing the tripods from the Orion class to start with!) so the next batch of models will be the 56 destroyers - of which the 24 I have for the Germans have hit a minor snag - more of which later. I arrived home yesterday evening (at my usual time of 7:35pm) to a welcome package from Stonewall Miniatures. Contained therein were the missing ships from mt 1/2400th WW1 collection including some Orion and Revenge class battleships, a Lion class battle cruiser and, to make up the minimum order required, a Hipper class cruiser from WW2. The castings need a little attention - specifically the Orion class as I will have to remove the rather awkward tripod foremast. I have removed the masts from all of my models for a couple of reasons. Firstly, they never seem to come out cleanly (to be fair the moulds are getting on a little) and secondly for gaming purposes they tend to get in the way. I realise that for C in C and GHQ these are included but they make for a fragile model - at least for me they do - and anyway, the Panzerschiffe types do not seem to have any and the Stonewall models will need to fit in with them from an aesthetic perspective. Mention of the Hipper will probably give a small clue as to where the collection will be heading once the WW1 models are completed - and for the record the casting is very nice indeed. She will be accompanying my previously painted model of the Bismarck on a foray into the North Atlantic at some point in the future. I managed to make a start on the bases for the British battleships but did not get very far before tiredness kicked in so I opted to stop for fear of messing something vital up! I noticed as well that I have managed to pass 250,000 page views - this is a quite astonishing achievement and so my humble thanks go out to everybody that follows my ramblings or that just drops by from time to time. I am coming up to the fifth anniversary of the blog so an average of 50K per year is pretty good going. I am conscious though that my blogging has slowed down somewhat due to work over the last year but many thanks to all for your continued support - it is, as ever, hugely appreciated. I had hoped to have had the eight 1/2400th scale Royal Navy dreadnoughts ready to unleash against the Kaiser but alas whilst the models are painted (with the first coat of varnish drying) the bases are yet to be completed so it will be a few days yet before the photo shoot. 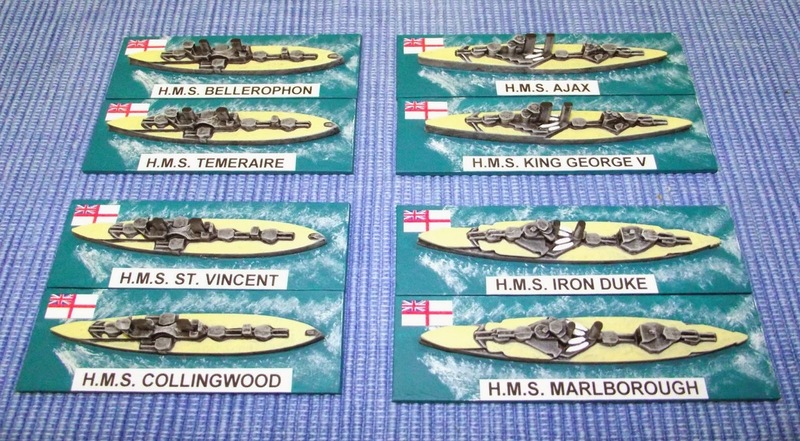 The models represent four of the classes used by the Royal Navy - the Bellerophon and the follow on St. Vincent classes (virtually the same as the original H.M.S. Dreadnought) the King George V class and a pair of the Iron Dukes. I have a pair of Queen Elizabeth class 15" gunned battleships ready to go but I wanted to get another pair of 12" armed earlier types and a pair of Orion 13.5" armed ships just to keep the balance somewhat. The Germans are going to get outnumbered very quickly at this rate - which I suppose has a certain degree of historical accuracy. The Grand Fleet is currently very modest but it will be a beast and a half when at full strength. I have a modest order to go to Panzerschiffe in the US for some gap fillers - primarily early battle cruisers - and will post bout these as and when they arrive. In the meantime though, the next part of the project will be the destroyers - of which I have 56 in total - but luckily these will be straightforward to tackle. In any event they are all based and undercoated and the names and numbers have been assigned. The plan as it stands will be to have the entire collection - including the Panzerschiffe models - completed by the end of next month although this does not include the additional armoured cruisers and pre dreadnoughts I will add in due course. The core collection though will be more than sufficient to be going on with! I will also need to start thinking about rules again but I have deliberately avoided doing so for the moment as the painting is the thing. It has been a busy weekend for various reasons but I have managed to complete the eight German dreadnoughts for 1/2400th scale WW1 collection. I followed the suggestion of Paul Hague in his book Sea Battles in Miniature and have represented classes on the basis of one actual model per two ships. Odd numbers above multiples of two are discarded and single ship types are represented by a single models. The models are 1/2400th scale Stonewall Miniatures and paint up quite nicely - I have said previously that they look like 1/3000th models on steroids or, crucially, are of a similar basic level of detailing to the models produced by Panzerschiffe in the US of A. The first class of German dreadnoughts - there were four built with the others being the Rheinland and the Nassau. They were armed with 11" main guns - 12 in all with 8 on a broadside. S.M.S. Westfalen cruising in an unusually blue North Sea! The Kaiser class consisted of five ships with the others being the Kaiserin, the Prinz Regent Luitpold and the Konig Albert. The Friedrich der Grosse was the fleet flagship until the S.M.S. Baden came into service. S.M.S. Kaiser - note the 'wing' turrets. The Konig class - configured similarly to the contemporary British 13.5" classes but with 'Q' turret on a higher deck. These were very good ships and were both very tough and quite handy, touching 24 knots on occasion. the remaining two ships were the Grosser Kurfurst and the Kronprinz Wilhelm. Very tough, fast but with a main battery of a lesser calibre compared to the Royal Navy. The first dreadnoughts the Germans completed were the Westfalen class, followed by the Helgolands, the Kaisers and then the Konigs. I am in two minds about the Bayerns but in any event do not have any in the collection as yet. The models were painted using my trusty 'black undercoat and dry brush with some detail blocked in' which works rather nicely and has the added advantage of being pretty fast as well. Mention of the Panzerschiffe models was intentional as I have decided that I shall use them for my gap filling as the C in C and GHQ ranges are too rich for my blood and also too detailed when set alongside the Stonewall types. 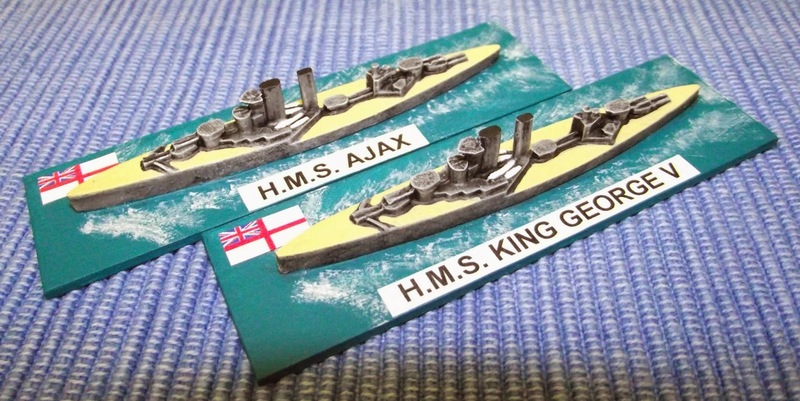 I am getting an order together for these and the first of which will tackle the thorny problem around the early battle cruisers as currently there aren't any! Aside from the models above I have also relabeled some of the Fezian and Rusland light cruisers into their correct nationalities. This now gives the RN eight and the High Seas Fleet six. I may add some others in due course as the Germans are rather limited for choice and I rather fancy the idea of commerce raiding in the early period of the war. I will be making use of Panzerschiffe for this element of the collection - simply because they make a fairly good range with a standard of detail that is ideal for my needs. Next on the tray are the Royal Navy dreadnoughts. Again, these will be in pairs although the Queen Elizabeth and the R classes may get 3 models a piece - although if I do that then strictly speaking I should add a further Kaiser class for the Germans as they had five of these. Small but perfectly formed - and a lot easier to carry around than a copy of Conways! 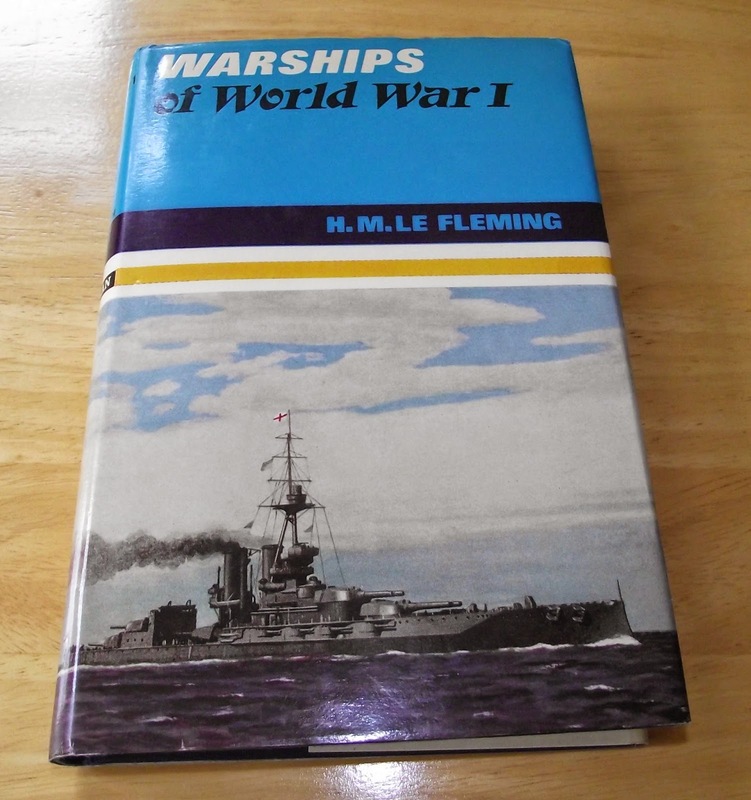 The other piece of news concerning this project is that was able to pick up a copy of the Warships of WW1 by H.M. Le Fleming and published by Ian Allan. This book was one that was on almost permanent loan from the library back in the day and so I was delighted to pick a copy at a boot sale for 50p! I have a copy of Conways and Janes for the period but for sheer convenience this is hard to beat! I have just finished reading the above title by Nigel Steel and Peter Hart - and what an absorbing and thoughtful read it is! 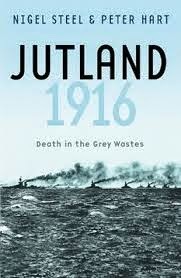 I have read a number of accounts of the battle of Jutland over the years, most of which are concerned more with analyzing the battle rather than telling the story with the participants in mind. Messrs. Steel and Hart manage to do just that and the result is a refreshing overview of what it actually felt like to be under fire in a warship during the Great War. It is a cliche to say 'all human life is here' but the pages seem to run the full gamut of emotions from hope, fear, expectation, melancholy and anger at the futility of it all. It is a sobering read in places and supported by a good narrative of the progress of the battle makes for an excellent account of the action. The authors have made much use of the Imperial War Museum archives and the eye witness accounts are utterly absorbing and thought provoking. I picked my copy up at a boot sale some time ago in paperback for some 50p but have decided to pursue a hardback version for the collection - simply because it is such a good read. In the meantime though, work progresses on the German dreadnoughts and I hope to have these ready at some point over the weekend. A small order is in with Stonewall for a couple of other bits and pieces so the overall project (which when complete will comprise around a hundred ships in total) is progressing nicely. I am hoping to have the entire collection completed by the end of June.